Cot Mobiles, Projectors and Take Alongs are an essential purchase for every parent constituting a significant proportion of the new baby gift sales. As a wholesaler of baby and nursery products, Baby Brands Direct, stocks leading industry brands such as Tiny Love, Fisher-Price, Bright Starts, Lamaze, Taggies, Lamaze, Disney, Munchkin, Baby Einstein, ELC, Lindam, and Safety First. Cot Mobiles, Projectors and Take Alongs are in high demand because they serve a great purpose. 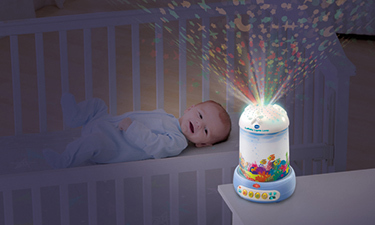 They are playful, cheerful and comforting items that assist in the baby’s sleep and relaxation. They also assist parents immensely in getting enough rest for themselves. Apart from beautiful designs you will also offer practical nursing solutions. In fact, new-born babies tend to snooze roughly 18 hours a day. Thus, parents look for the best ways to relax their littles ones. With our extensive portfolio your customers can choose from musical to light therapies that will help parents create that nursery a special growing up space. Cot mobiles also assist in strengthening baby's muscles and baby’s coordination development. The top seller, Fisher-Price Rainforest Mobile, is designed to boost baby's visual stimulation with its colourful rainforest characters that spin as the mobile rotates. To find our more what your clients get with each item, browse the following pages and dive into our premium selection.